There are many benefits that come hand in hand with a universal remote control including the ability to control more than one devices, the option to customise your remote based on your requirements and you will also able to merge the functions of your original remote with your new universal remote. 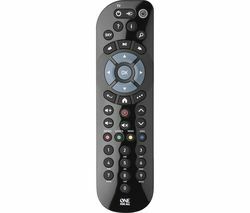 Within this category, you will find a great choice of highly functional One For All remote controls that are compatible with TVs, Freeview boxes, DVD and Blu-ray players, amplifiers, home cinema kits and many more, the remote can work universally with all brands. 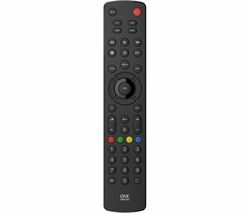 One of the most popular One For All remote controls in this range is the One For All Contour 4 Devices Universal Remote Control. Allowing you to enjoy the convenience of operating up to four devices with just one remote, customise the key functions of your remote using the learning function, as well as a slim design for a comfortable grip, this One For All remote control has also been pre-programmed to used with over 1500 different brands. Helping to prevent unnecessary clutter in the home, this universal remote control will also mean that you won’t have to search for different remote controls in order to operate the home entertainment systems in your home. All of our One For All remote controls have also been expertly developed in order to optimise ease of use, meaning they are super easy to use and most important, simple to set up and operate. Featuring all of the operating buttons you would expect to find on a standard remote control, all of the universal remote controls in this category will allow you to customise the key functions to suit your individual preference. If you can’t find a One For All universal remote control that meets your needs, don’t worry. We also offer plenty of other options including remote controls from brands such as Sky remote controls. You will also be able to view a huge range of HDMI cables.